Today after taking your early morning breakfast, you will checkout of the lodge and drive to visit the Kigali genocide memorial grounds, which honors the memory of the more than one million Rwandans killed in 1994 through education and peace-building. You will be able to watch and listen to some video clips from some of the survivors’ of the incident. Later you will proceed with a drive to Bwindi through the magnificent route to your booked accommodation to catch up with the late lunch and later spend the rest of the afternoon relax and prepare for the next day’s trekking. Diner and overnight at Mahogany Spring lodge (luxury lodge) or Engagi lodge/Silverback Lodge (Mid-range lodge), or Broadbill Forest Camp (Economy lodge). Meal plan: Full-Board. Early morning cup of coffee, then prepare for the briefing from the Uganda wildlife officials and thereafter enter the jungle to search the shy mountain gorillas and enjoy their life style in their real home. After meeting the gorillas, you can sit around these great apes for a whole hour gazing into their big round eyes. On a gorilla safari, a reasonable degree of fitness is required as well as walking shoes, packed food and mineral water, insect repellent, sun screen and hut. The gorilla tracking experience takes half or whole day depending on the movement of these primates. After this gorilla tracking experience in Uganda you will have informative memorable experience in life. In the afternoon, you will be transferred to another gorilla sector within the Bwindi for your next day trekking. Diner and overnight at Gorilla Safari lodge (luxury lodge) or Ichumba Gorilla Lodge (Mid-range lodge), or Rushaga Gorilla Lodge (Economy lodge). Meal plan: Full-Board. Day 4: Second Gorilla trekking & community walk visit. Early morning cup of coffee, then prepare for the briefing from the Uganda wildlife officials and thereafter enter the jungle to search the shy mountain gorillas and enjoy their life style in their real home. After meeting the gorillas, you can sit around these great apes for a whole hour gazing into their big round eyes. On a gorilla safari, a reasonable degree of fitness is required as well as walking shoes, packed food and mineral water, insect repellent, sun screen and hut. The gorilla tracking experience takes half or whole day depending on the movement of these primates. After this gorilla tracking experience in Uganda you will have informative memorable experience in life. In the afternoon, ready for a village foot safari, to explore the indigenous local life with a taste of the traditional performance. Diner and overnight at Gorilla Safari lodge (luxury lodge) or Ichumba Gorilla Lodge (Mid-range lodge), or Rushaga Gorilla Lodge (Economy lodge). Meal plan: Full-Board. End of the 5 Days Double Gorilla Tracking Safari. 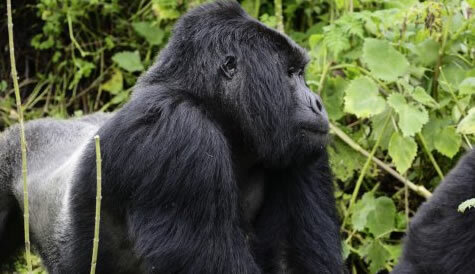 This 5 Days Double Gorilla Tracking Safari package includes. The 5 Days Double Gorilla Tracking Safari package excludes expenses of personal nature like: Air fare, Visa, drinks, laundry, tips to local guides, telephone, porter fee while trekking, personal insurance, personal shopping bills and cigars.